Dynamite Entertainment are releasing James Bond story's like there is no tomorrow. I am not complaining, not at all, I just wish to be able to lay down the first one before I need to read the next one. What's good about this is that Dynamite Entertainment must be satisfied ow the sales the comics has achieved so far. Below is the full press release that went out today regarding their upcoming new story SERVICE that will be out this May. February 20, 2017, Mt. Laurel, NJ: Dynamite Entertainment introduces an all-new take on the icon of espionage in an upcoming oversized special written by Kieron Gillen (The Wicked + The Divine, Star Wars: Darth Vader) and drawn by Antonio Fuso (Torchwood, Drive)! "A chance to write a British icon is something that's basically irresistible," says writer Kieron Gillen. "This is like getting to write the sun rising. You've known it all your life, but this time it's yours. I wanted to do a story that was classically Bond, but spoke to Britain as it is, and Britain as it was. In short: I was looking for any excuse for Bond to use a Sten-gun." Artist Antonio Fuso says, "James Bond means England, and I love England. I also love spy stories, black suits, deadly pocket guns, smart smiles, and Kieron's scripts. Read this book, spread the love, and God save the Queen." Regarding his collaboration with artist Antonio Fuso, Gillen adds, "It's a thrill working with Antonio, whose modern lines lean into a realistic take on a modern Bond." "Kieron Gillen is undoubtedly one of the best writers, and among the best-loved, in comics today, and it's an absolute honor to now work with him on one of Dynamite's most celebrated titles," says Dynamite CEO and Publisher, Nick Barrucci. "Ian Fleming's James Bond is perhaps the most elevated of intellectual properties in the history of pop culture, an icon whose mere mention evokes a sense of class and distinction. We're proud to bring such high caliber writers to this franchise: Warren Ellis, Andy Diggle, James Robinson, Benjamin Percy, and now Kieron Gillen. Partner him with a hot talent like Antonio Fuso, and we've got the perfect team for an explosive, done-in-one thriller!" "I'm delighted to be working with Kieron for the first time," says Joe Rybandt, Executive Editor. "He's a fantastic writer and a tremendous asset to the ever-expanding world of James Bond comics from Dynamite." James Bond: Service will be released as a 48-page special, solicited in Diamond Comic Distributors' March 2017 Previews catalog, the premier source of merchandise for the comic book specialty market, and slated for release in May. Comic book fans are encouraged to reserve copies with their local comic book retailers. 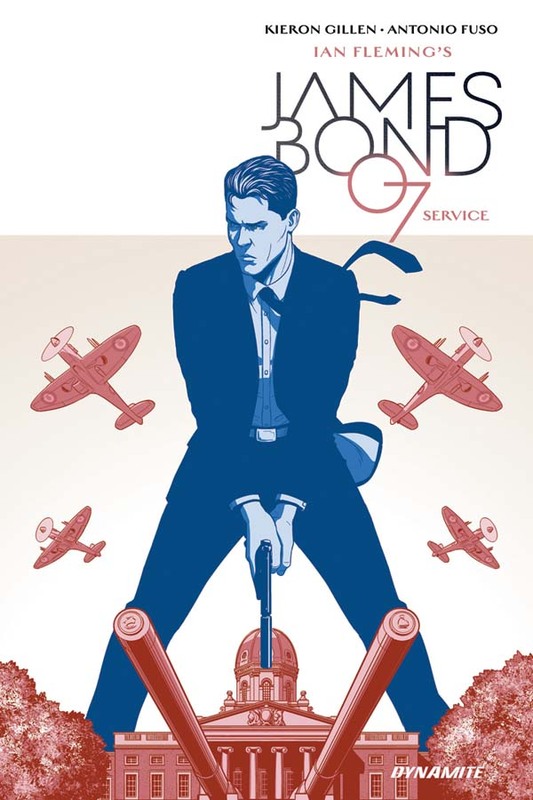 James Bond: Service will also be available for individual customer purchase through digital platforms courtesy of Comixology, Dynamite Digital, iVerse, and Dark Horse Digital. I pre ordered my copy right away but do not that the press release does not say which date the comic is released. In other words there will be two new James Bond story's out this may.